Bird communities are important, visible components of biological diversity on managed forest landscapes. As such, they are of significant interest by the public, regulatory agencies, and environmental non-governmental organizations (ENGOs). Many bird species are experiencing long-term declines, leading to concerns about future population viability. Actively managed forests provide diverse forest types and stand structure to support forest-dependent bird communities. Additionally, birds respond strongly to forest structure, their ecology is relatively well known, and sampling protocols are well-defined making them an ideal community for examining biodiversity response to forest management. However, additional work is needed to better understand ability of working forests to assist with conservation of bird communities. As such, NCASI has a long history of supporting research examining bird communities on working forest landscapes. In the eastern U.S., previous research supported by NCASI and others has documented importance of young forests to species of high conservation priority. Currently two studies, one in Minnesota and one in Mississippi, are working to understand bird communities in young forests. In Minnesota, the focus is on species of concern including the Golden-winged Warbler, Veery, and American Woodcock. The research in Mississippi is continuing an ongoing study to examine vegetation and breeding bird responses in loblolly pine stands established in 2010, including forest stands treated with herbicide for hardwood release. A goal of this study is to obtain data on bird-habitat relationships in loblolly pine stands for an entire forest rotation. Results from these studies will help inform forest management decisions and demonstrate the conservation value of working forests for birds. Additional projects are being conducted to better understand response of bird communities to forest management. The first is the Intensive Forest Management Study (IFM), which was designed to understand response of ecological communities to different levels of simplifying vegetation communities through herbicide application in regenerating Douglas-fir stands. Staff will work with collaborators to continue to collect field data on birds and develop products from the first eight years of bird abundance and bird community structure data. A second, related study, will help quantify food supply, which for leaf-gleaning birds, is primarily arthropods, as part of the IFM study. A third project is investigating demographics of black-backed woodpeckers in unburned coniferous forests. 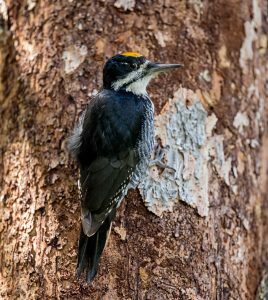 The Black-backed Woodpecker was recently considered for Federal listing because of concerns over habitat loss. Despite the not-warranted finding for this species, effects of management actions (e.g., thinning, fuels treatments) on black-backed woodpeckers remains unstudied. Such data are important to understand how this species of concern uses forested landscapes. Finally, NCASI is cooperating with Member Companies, the Sustainable Forestry Initiative, and the American Bird Conservancy to better understand contributions of managed to bird conservation. This handbook details 18 different practices, providing information for each one on the basis for the practice in conservation science, how to apply the practice, measures of effectiveness of the practice, and the compatibility of each practice with others. This interview provides discussion of methodology for the determination of conservation and listing status of species. Dr. Darren Sleep of NCASI Canada is interviewed. This interview discusses the advantages of conservation oriented research conducted from a non-profit perspective. This interview addresses green tree retention practice, and research to demonstrate quantitatively its effect upon richness and abundance of avian, bat, and invertebrate communities of red and jack pine before and after retention of contrasting levels of green trees in Minnesota and Wisconsin. NCASI seeks to provide technical information needed to manage species of high priority while also meeting economic objectives. Presentations related to CEPA Chemicals Management Plan (CMP). Over the last several decades, concerns about biological diversity have led to dramatic changes in forest policy on public lands, harvesting constraints on some private lands, and concomitant impacts on timber supply. In many cases, biological diversity is best addressed at the landscape scale.